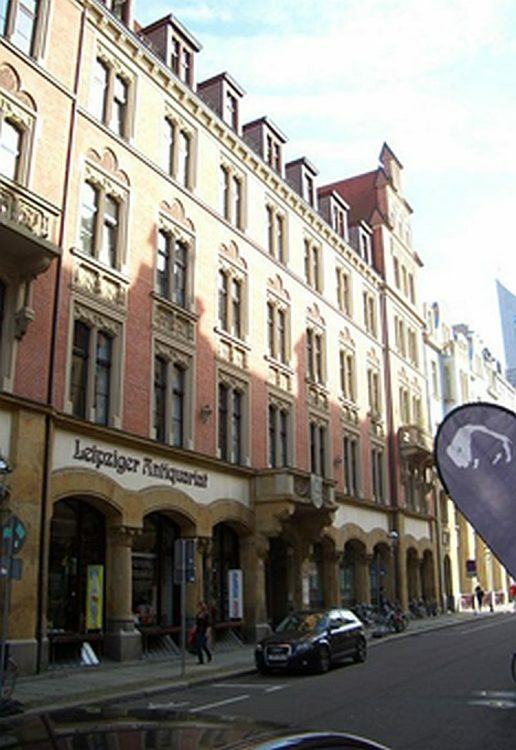 Leipzig University has enriched the intellectual and cultural life of the city of Leipzig for six centuries. Founded in 1409 it is the second oldest university in Germany with uninterrupted teaching and research programmes. Numerous personalities of worldwide renown have taught or studied here, with important sources of inspiration for the development of the sciences repeatedly originating from Leipzig. As the State University of Saxony it has made an important contribution to the development of the region. The University has gained a national and international reputation thanks to its wide range of subjects and particular emphasis on the Humanities, Natural Sciences and Life Sciences. Today Leipzig University is striving for a leading position amongst German universities as a university which is both steeped in tradition while at the same time being a modern comprehensive university. The 14 faculties with their 150 institutes place emphasis on cross-subject and cross-faculty cooperation in research and teaching. Furthermore the development of the University is defined by cooperation with other research institutions and regional businesses along with increasing internationalisation. 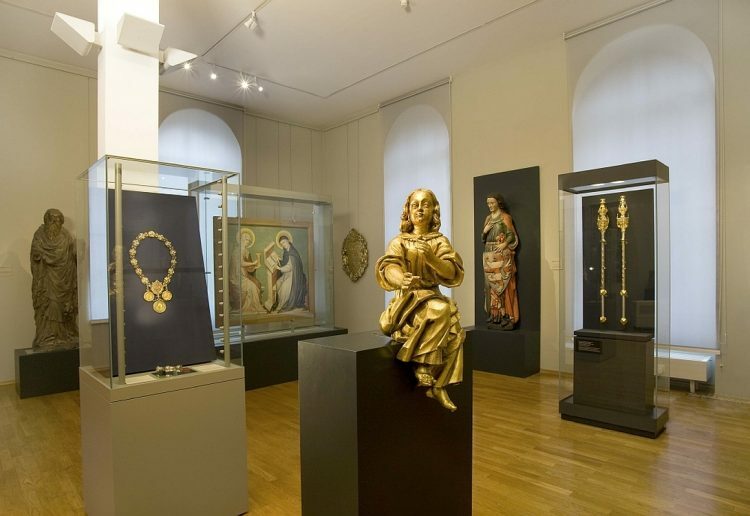 The University also enriches the cultural life of Leipzig with its over 450 year old University Library, the University Archive, the Art Collection and the German Creative Writing Program Leipzig (Deutsches Literaturinstitut Leipzig). Many visitors are attracted by the oldest botanical garden in Germany, the University’s three museums and the teaching collections. The University Orchestra, the University Choir and the Unibigband entertain thousands of visitors each year. the New Augusteum with the Auditorium maximum and the Paulinum characterise the face of the University in the heart of Leipzig. The form of the Paulinum is reminiscent of the University Church of St. Paul which was destroyed in 1968. Important university events, concerts and church services take place in the assembly hall and University Church. 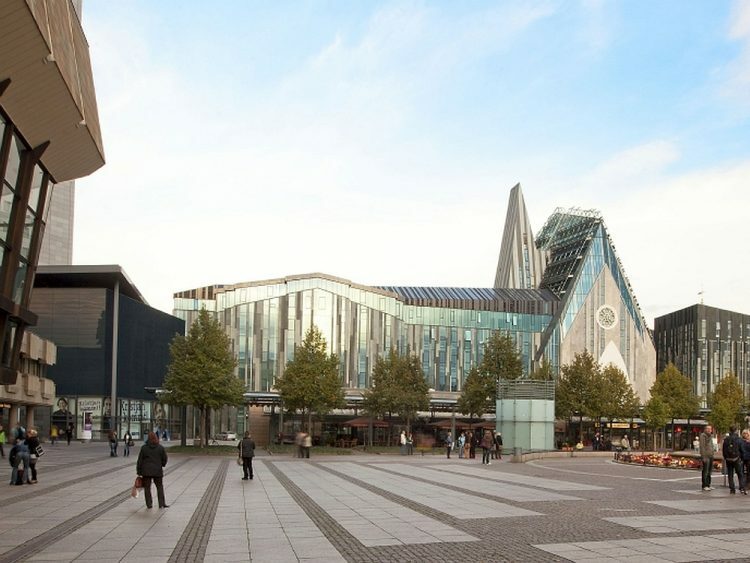 The building of the Faculty of Economics and Management Science fits in harmoniously with the shopping area in the pedestrian precinct in Grimmaische Straße. Directly in the centre of the city there are therefore favourable studying conditions in particular for the Humanities. New Augusteum and Paulium – View from Augustus Place to the Assembly Hall und the University Church St. Pauli – close to the Gewandhaus an the Opera Leipzig. preserve its tradition as a classic Central European University of international standing which has grown over the centuries and strengthens its role as an international teaching and research institution for the exchange between East and West, North and South. The Centre of Competence for Theatre (CCT) is an academic institution at the Faculty of History, Arts and Oriental Studies at Leipzig University. Our Team works on regional, national and international cooperations in the area of theatre and cultural education. It acts as a gateway between the arts, the humanities and the society and links expert knowledge on every field of theatre and art production in order to strengthen their visibility. The Centre of Competence extends the academic discipline of Theatre Studies by a decisively practical approach: it cooperates with theatres, companies and cultural institutions and supports practice-oriented research and exchange between theory and practice in the areas of teaching and education. Partners from within the university as well as from state theatres, independent theatre companies, associations and advocacy groups on a regional and national level support the CCT with their expertise and practical knowledge. The Centre of Competence conceives itself as a hotspot for public communication and mediation of academic research and transcultural education that has an impact on our contemporary society. It provides a forum for the public discussion of aesthetic, cultural as well as political questions that changing societies are dealing with constantly. Moreover, the Centre with its broad international network serves as an important factor of future education and training in the area of theatre and performance. 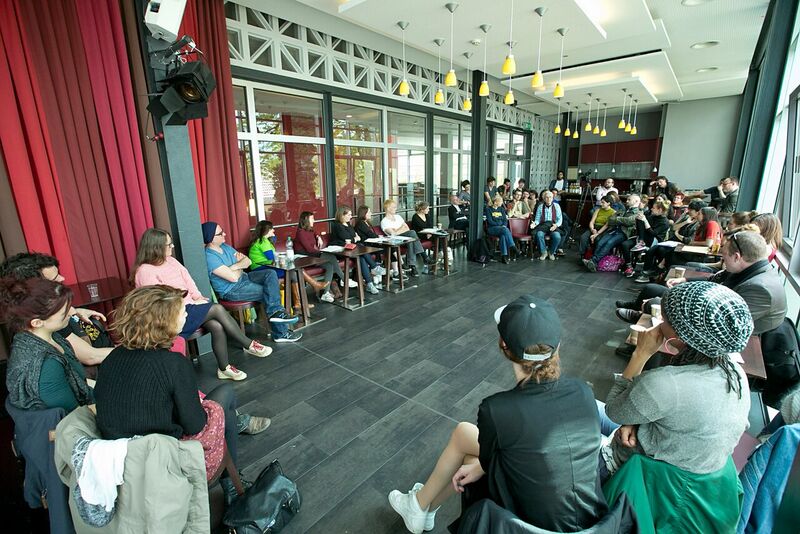 Scientists, Students and Theater Practitioners during an intensive discussion during the theatre festival WILLKOMMEN ANDERSWO – sich spielend begegnen in May 2017 in Bautzen – one example of how the CCT understands its mediation work . To increase the CCT’s visibility and to brace the international expertise in research, teaching and public mediation in Leipzig, the Bertolt Brecht Visiting Professorship of the City of Leipzig at the CCT was established in the winter semester 2017/2018. This professorship supports a sustainable exchange between theory and practice within science and arts in the teaching of the institute of theatre studies and the discourses in the city. Every semester this professorship is given to outstanding practice-representatives of the performing arts and their medial reflections. They are a verifiable enrichment for the scientific discourse and/or the provision of the mutual reflection of the theatre’s theory and practice in its diversity. The first Bertolt Brecht Visiting Professor was the internationally renowned and numerously awarded director Peter Konwitschny. Some of his most important works were presented in Leipzig during an open discussion; Konwitschny worked out a scenic project with students of the institute of theatre studies on the modern opera Die Soldaten by Bernd Alois Zimmermann during his professorship. During the summer semester 2018 it was Motoi Miura who was designated as the Bertolt Brecht Visitng Professor of the City of Leipzig. He is one of the most famous directors of the present in Japan with international impact and emission. Miura and his company CHITEN (“place”) from Kyoto refer to Brecht explicitly and implicitly: With FATZER (2013) they had two guest performances in Leipzig and during the Fatzer-Tage in Mülheim. In the context of his professorship he worked scenically on Die drei Schwestern by Anton Tschechow. 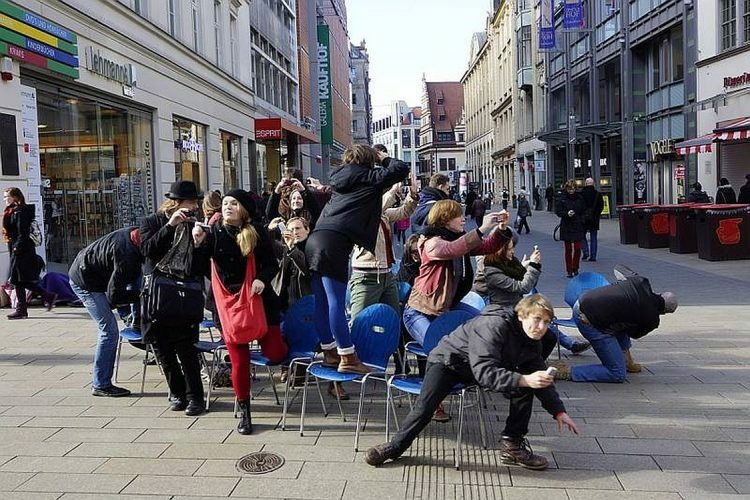 During the 16th Symposium of the International Brecht Society BRECHT UNTER FREMDEN Motoi Miura and CHITEN will perform the performance Brechtseller in Leipzig. Theatre as a (popular) cultural practice that exceeds professional theatre practice and its institutions: theatre by or with non-professionals and/or amateurs, inclusive theatre practices, theatre for and with refugees, marginalised groups, minorities etc. The study of theatre has been existing in Leipzig as a part of different institutions since 1922. Its eventful history concluded in the foundation of the Institute of Theatre Studies Leipzig in December 1993, which began its teaching activities during the following winter semester. To date Theatre Studies in Leipzig developed a unique profile in the german-speaking community: Theatre is explored in its different manifestations regarding historiography, historic anthropology and transmediality, whereas all of these disciplines are understood as corresponding to each other. The term Theatre embedded in an historical-critical discourse as cultural practice comprises all ritualistic-playful, social and artificial practices in accordance with the historically varying Institution of Theatre – always related to history as a whole rather than single periods. Theatre as practice, artform and institution is a constitutive element of any culture. We study the historical and regional differentiation of this cultural element in its structures, forms and functions. We investigate all specifications of theatre – like opera, dance, drama and puppetry – as well as theatrical practices both inside and outside institutionalized theatre. For instance the enactment of the political, aestheticization of every day life, forms of self-portrayal of society and the ritualization, reenactments of historical events or public spectacles. 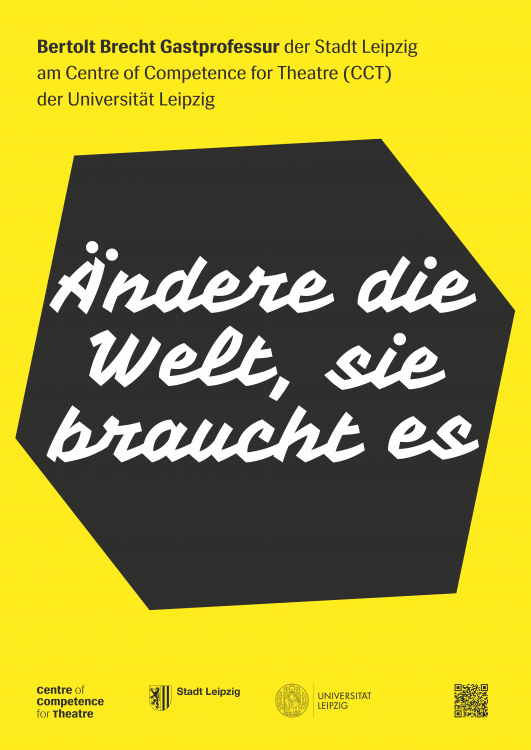 Thus – in particular for the german-speaking theatre science – the necessity arises to connect theatre of the present and history of theatre in study, teaching and practice in an encompassing and thorough manner. From a methodological perspective this corresponds to a common view of the historicity and the procedure of historicization, a critical relativization of inherited patterns, values and institutions as well as short term paradigm changes in the scientifical discourse. The historicity of present (trans-)cultural practice and the manifestation of history in presence are reflected upon. Among others this occurs through the publication series Leipziger Beiträge zur Theaterforschung, the third party funded scientifical projects related to the inventories of the Tanzarchiv Leipzig as well as the relation between work and rhythm, as well as the DFG research project Das Theater der Wiederholung. 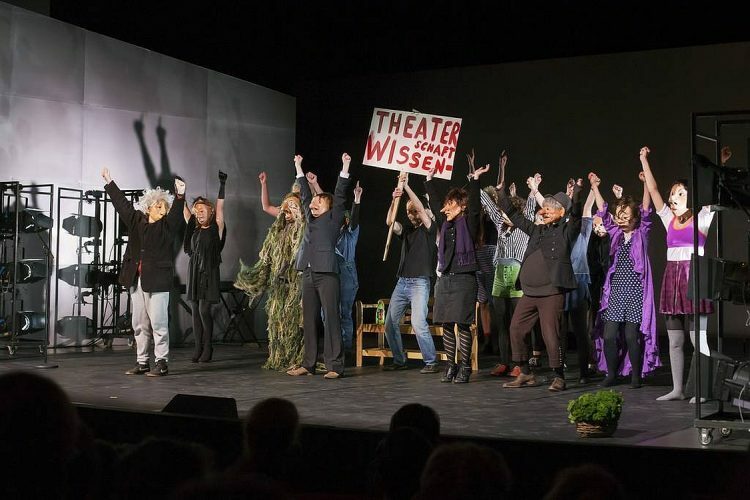 Students of Theatre Studies in Leipizig with masks of Familie Flöz (Berlin) during the solidary event „Die Theaterwelt läuft Sturm“ in February 2014 at Schauspiel Leipzig. The degree Theatre Studies in Leipzig offers excellent perspectives for future career development. The scientific structure and the organization of the degree are oriented towards future working fields. To accomplish this new developments are recognized early and actively co-designed rather than exclusively working towards current business activity of present institutions. According to the newest alumni-survey the emphasis of professional activities lies in production, dramaturgy as well as PR of theatre institutions and festivals or independent theatre-, dance- and performance groups, as well as the increasingly relevant area of curatory activity and both cultural and event related management. Our students are active not only in further scientific and practical work at higher education institutions and cultural establishments, but also in institutions dedicated to review theatre, film and art like radio, television, printed media and the internet.